Community and Lifestyle in Playa Hermosa, Costa Rica. 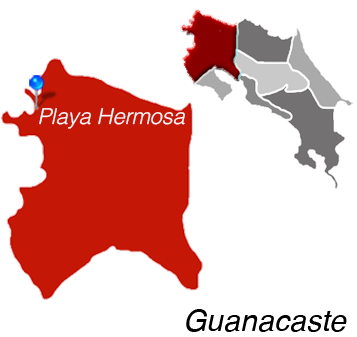 The town surrounding Playa Hermosa offers services such as grocery store, pharmacy, local police station, and two private banks with ATM machines. In addition, there are various restaurants throughout the town of Hermosa, and a majority of the homes within the town feature sweeping views of the Pacific Ocean. Those seeking a bit more excitement on any given day can head to Playas del Coco, located only 10 minutes south of Playa Hermosa. Here, one will find doctors, dental services, National banks, health clubs, real estate agencies, and fast food chains. For hospitals, professional services, and large stores the equivalent of Home Depot and Wal-mart, many people drive to Liberia, located only 40 minutes away from Playa Hermosa. The beach itself is an amazing place to relax and enjoy water sports like scuba diving, snorkeling, and sailing. Playa Hermosa is also near the Papagayo Gulf, which is packed with exuberant and gorgeous beaches and luxury hotels such as a Hilton, Four Seasons, and others. Beaches like Ocotal, Playa Panama and Mata de Palo here the huge and gorgeous Riu hotel was developed are minutes away from Hermosa. Most of the Guanacaste area has excellent road conditions, and so driving to places like Tamarindo, Playa Grande, Playa Flamingo, and Playa Potrero can be done within an hour. The Rincon de la Vieja Volcano, one of Guanacaste’s main attractions featuring a true active volcano and thermal waters, is located only 65 kilometers from Hermosa, and is a perfect day trip for hiking enthusiasts. Also nearby Playa Hermosa is Africa Mia, a family friendly African Safari that is a heavy favorite among tourists and locals alike. Other National Parks easily accessible from Playa Hermosa include Santa Rosa, Playa Naranjo (also known as Roca Bruja or Witches Rock), and Palo Verde, a reserve that is home to thousands of animal species and natural wonders. 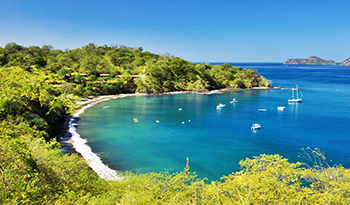 Krain Costa Rica real estate is the number one brokerage Costa Rica has available. We specialize in hard to find Playa Hermosa, Guanacaste MLS property searches and have been featured on House Hunters International. Are you searching for beachfront real estate in Guanacaste or more Playa Hermosa area based land searches. Contact us today to find out why we are the number #1 real estate costa rica has to offer foreign investors.